The beach was pretty empty on Sunday morning when we first ventured out. There were other people on the beach ... it wasn't TOTALLY empty ... but it wasn't the typical Week-After-the-4th Crowd you might expect to see. Particularly in the water. But don't worry. There don't have to be any other people around. Because when we bring all our stuff out, we take up enough room for the entire county. I mean, here's our stuff. Spread out in front of four entire houses. 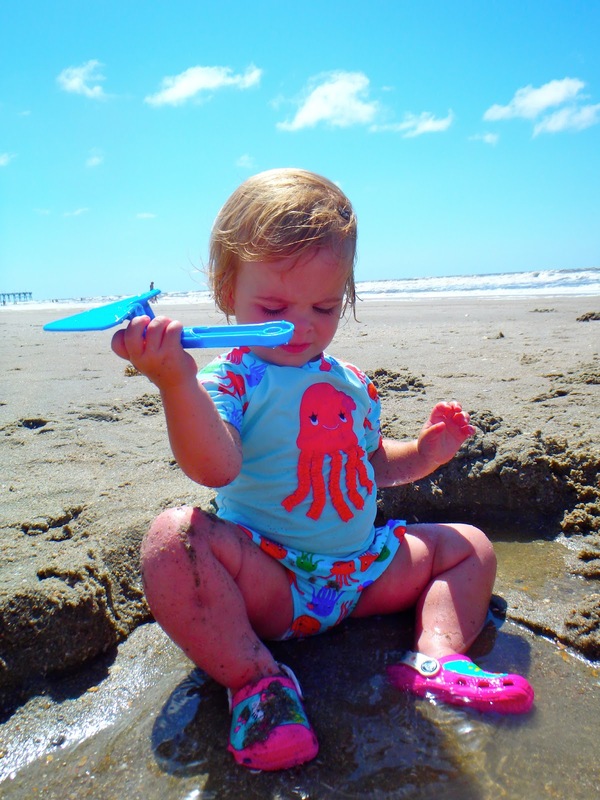 I am about to show you a few pictures of Amelia on the beach. In the sand. Please enjoy them. Burn them into your memory bank. Because she did not enjoy the beach or the sand, so there are precious few of them. These may be it, actually. I dug a hole for her on Sunday, and she was happy to play in it for about 15 minutes. If you are mathematically-challenged, that is equal to one-quarter of one hour. Of one day. And then she was "All done beach," ready to go back to the house for the rest of the day. This being our fourth time around the proverbial block, we'd kind of figured this was going to happen. 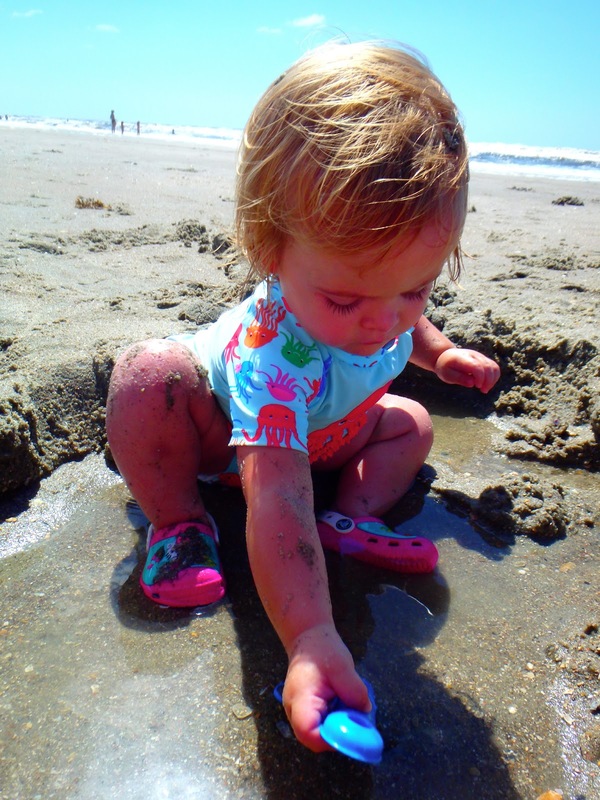 None of our kids have loved the beach until at least age 3. I did want to grab a few more pictures before she and I headed back to the house, though. The cotton-candy clouds were so pretty, and the beachfront was so empty it almost felt private. 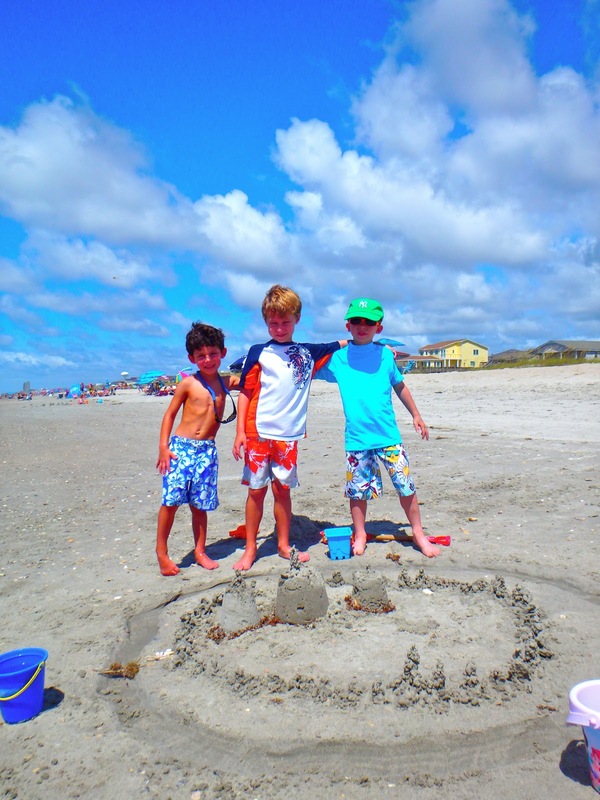 The kids split up into three teams and started a sandcastle-building contest. They ran back and forth from their castles to the ocean, trying to fill their moats with water. Coleman, Jack and Will comprised Team 1. Grant, Charlie and Nick comprised Team 2. And Anna Kate, Abby and Ali were the mighty Team 3. THEIR CASTLE HAD MONOGRAMMED As, INTERNET. Eventually Grayson did let our boys go waist-deep in the water with him, but I don't think anyone else's kids went in the water on Sunday. For the most part, it remained a day of sandy play. Please enjoy how I took this picture for you where everyone's backs are turned to the camera and Mikey appears to be taking care of a wedgie. Well, except for Jack (on the left). Jack was standing in protest of something or another. I did not investigate the circumstances, because that might have required my involvement, and you can clearly see his mother standing there behind the other kids. I left it up to her. After all, I had an "ALL DONE BEACH Girl" to tote back up to the house. Tired of the beach yet? Too bad! We've got days and days to go.